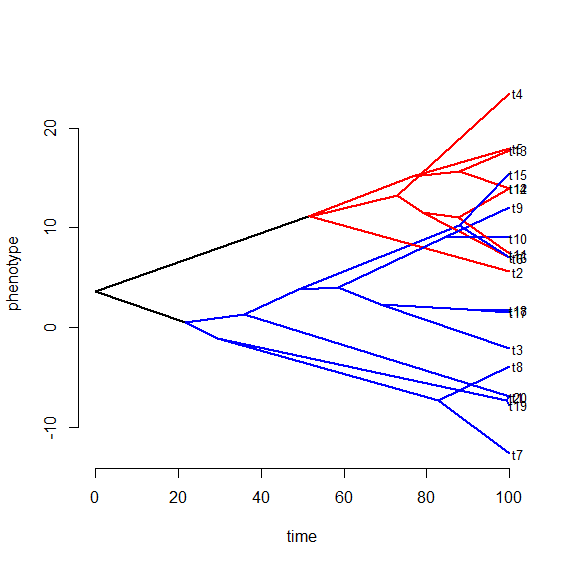 is it possible to create a phenogram (that is, a projection of the tree into a two dimensional space defined by morphology on the vertical axis and time, see here) with different clades as different colors? The function phenogram already allows a mapped discrete character, so if we want to color arbitrary clades on our tree different colors, we just need to combine phenogram with the phytools function paintSubTree, described here. 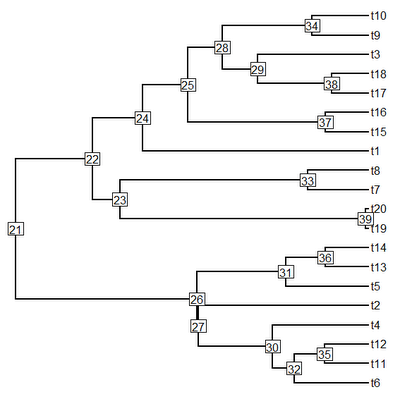 OK, this tree has two main clades: one descended from node number "22", and the other descended from node number "26". Let's first paint the former clade with state "2" and the latter clade with state "3", we can leave the stem branches of each clade in state "1" (although we need not).